Bear with us… The Doctor returns on Friday night! If you can’t wait until Christmas to catch up with the Doctor, make sure you’re watching Children in Need on BBC One this Friday night! 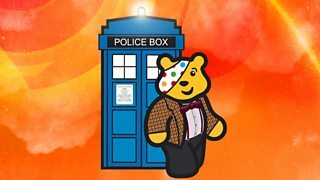 Doctor Who has a long tradition of taking part in Children in Need and this year fans are in for a double treat! There’s a brilliant new prequel to the Christmas Special starring Matt Smith as the Time Lord and featuring a number of familiar faces… If you need any more incentive to tune in we’ll just add that it was written by Steven Moffat! Aside from that, there’s a new, exclusive preview trailer of the Christmas Special that includes the first glimpse of the Doctor with his new companion… Both items will be on BBC One on Friday, 16 November and will be available to view online soon after their Children in Need premiere. Want to get involved with Children in Need? You can find out more, including how to donate and what’s happening in your local area by visiting the Children in Need site now! The Writers' Guild: Awards Success!